Property 10: Living in Venice and enjoying the tranquility of the countryside is possible. Marco was great to deal with and went above and beyond our expectations. The property is neat clean and in a great location. The apartment is really nice and modernized with the best beds we experienced in Italy. The property provided bikes we're nice to use and made trips to the area businesses a breeze. The property is centraly located about a 15-20 minute ride to Venice. Marco provided all the information needed about the area, right down to the bus schedule and best restaurants to eat at. Don't hesitate to stay here! 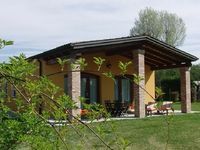 Absolutely PERFECT place to stay in Veneto region of Italy! This was just the highlight of our trip to Italy - my only regret is that we didn't stay here for more than a couple of days! This would make the nicest week-long holiday ever...summer, spring, fall, or winter! Quick bus to Padova or Venezia, plus the little town is just wonderful to walk around and bike. Lots of beautiful villas to see around there. Marco, the owner, is so nice and respectful of your visit - my best experience ever with VRBO (and Airbnb, too!) Place is well decorated, beautiful outside, private and quiet, and there are bikes available for you to use anytime. Really, you don't want to pass this up.